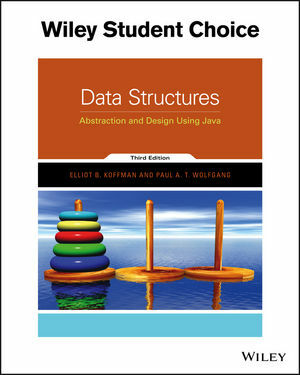 Data Structures: Abstraction and Design Using Java, 3rd Edition, combines a strong emphasis on problem solving and software design with the study of data structures. The authors discuss applications of each data structure to motivate its study. After providing the specification (interface) and the implementation (a Java class), case studies that use the data structure to solve a significant problem are introduced. New Introduce new features of Java 8 where appropriate. The authors use the Java 8 StringJoiner in place of the StringBuilder for creating delimited strings. The text also features Java 8 functional interfaces and Lambda expressions. New Additional emphasis on testing and debugging in Chapter 3. Chapter 3 features different aspects of testing (e.g. top-down, bottom-up, white-box, black-box), as well as a section on developing a JUnit test harness and a section on Test-Driven Development. New Ease the transition to Java for Python programmers. When introducing Java data structures (for example, arrays, lists, sets, and maps), the authors compare them to equivalent Python data structures. Combines a strong emphasis on problem solving and software design with the study of data structures. The authors discuss applications of each data structure to motivate its study. After providing the specification (interface) and the implementation (one or more Java classes) we then cover case studies that use the data structure to solve significant problems. Focuses on implementing effective programs using the Java Collections Framework and the classes in the framework. The code for these classes follows closely that which is provided in the framework and is not a conversion of code in other programming languages. Many problems have extensive discussions of testing and include classes and driver methods for testing solutions to case studies.